Despite being the 9th largest country in the world, Kazakhstan is a country that not many people are aware of and, until now, it has only attracted the attention of the most intrepid travelers. 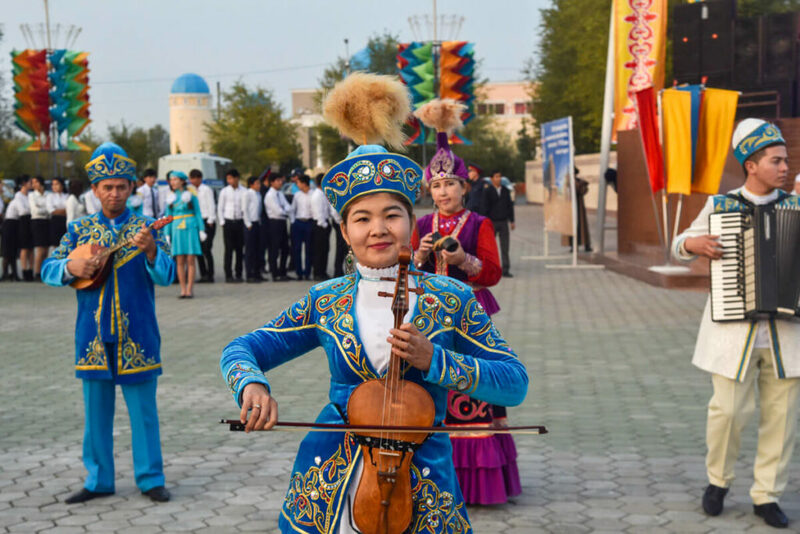 For some reason, after hermetic Turkmenistan, Kazakhstan is the most off-beat country in Central Asia. When I was thinking about it, I came to the conclusion that, whereas people visit Kyrgyzstan for trekking, go to Tajikistan to drive the Pamir Highway and travel to Uzbekistan for its stunning architecture, it seems that, since Kazakhstan has a little bit of everything, travelers don’t really know why you should go there. However, the way I see it is that, if you allow enough time to visit it, you will see that, given its dimensions, Kazakhstan is a country full of contrasts and a different world from the rest of Central Asia (and the Earth), which range from the strangest things in the world, such as the Aral Sea, the Russian town of Baikonur, the extravagant capital of Astana, and even a desolated town where the USSR used to test nuclear weapons, to striking mountains and epic train journeys through the endless Kazakh steppe. Kazakhstan is one of those destinations which you really don’t expect because, in addition, this oil-rich country is also the most developed of all the Stans, home to a cosmopolitan city named Almaty, which is, by far, the most European city in the whole of Asia. I strongly believe that this should be at the very top of everyone’s bucket list and that’s why, after spending one full month backpacking in Kazakhstan, I decided to share with you 3 different Kazakhstan itineraries, which are adaptable to any kind of traveler and duration of trip. 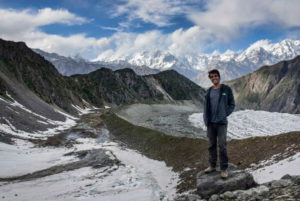 When to go – Despite being such a big country, the climatic conditions across the country don’t change as dramatically as in other countries, like Iran or Pakistan, for example. This means that, across the whole country, winters will always be very cold and summers very hot. However, as a general rule, north Kazakhstan will always be colder than the south. I visited it during the month of November and, whereas the south was pleasant, with temperatures ranging from 5 to 20ºC, the north was much colder. I think that, unless you really want to explore the north or do some serious trekking, backpacking in Kazakhstan can be done all year round. Language – Kazakh, a Turkic language, is the official language in the country. Nevertheless, Russian is the second language for pretty much everyone in the country and, in places like Almaty, is the predominant language in the city. I strongly recommend learning some Russian or, at least, the Cyrillic alphabet before your departure as, outside of Almaty, nobody speaks English. Moving around by train – The old Soviet train is the best way of backpacking in Kazakhstan. You can go to practically anywhere in the country and it is an experience by itself. 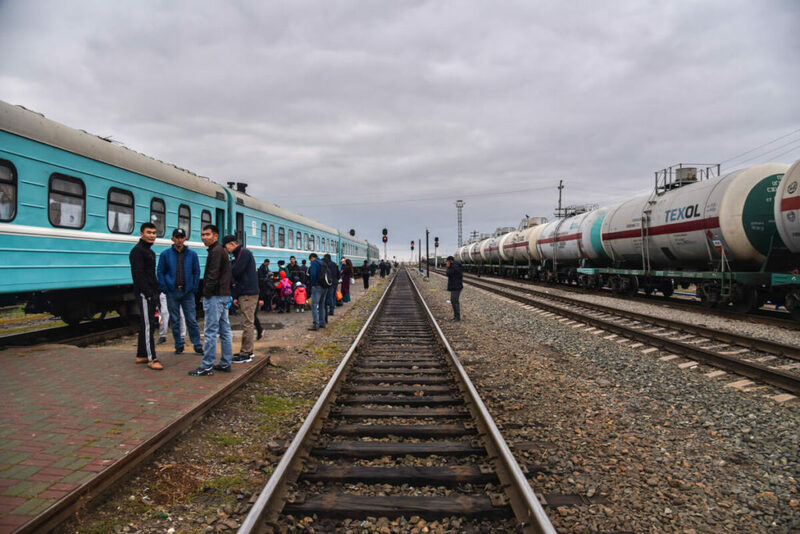 For more information, including how to buy tickets, types of trains, routes, etc., read: How to travel by train in Kazakhstan. Kazakhstan is a very safe country, with crime rates much lower than European countries. 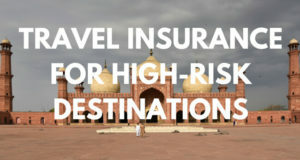 However, regardless of where you go, you must be properly covered with the right travel insurance. World Nomads is the one I always recommend. Why? 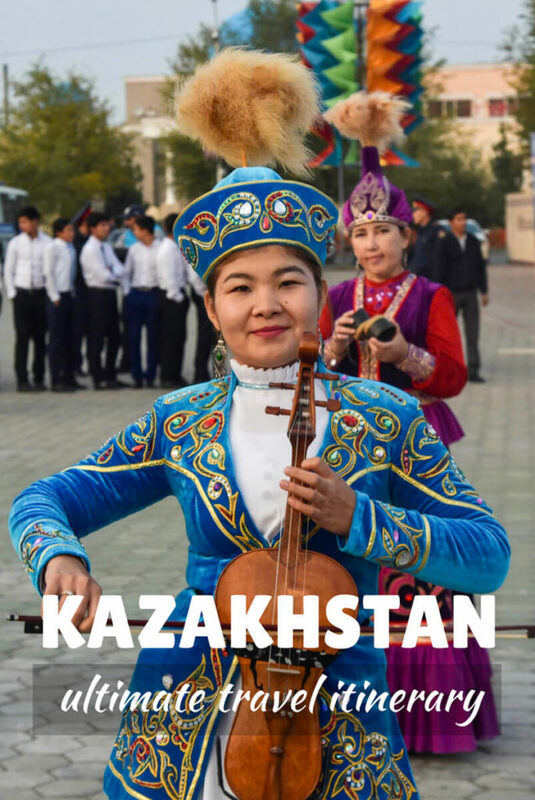 Kazakhstan Book Guide by Bradt (2018) – This is the most complete and up-to-date guide about Kazakhstan. I love Bradt because, unlike other guides, they always give such detailed local insights, as well as many tips for the independent traveler. Central Asia Book Guide by Lonely Planet (2018) – If you are planning to go backpacking across all Central Asia, it might be a good idea to just buy the regional book. Russian-English Phrasebook – You’re gonna need it, especially during your long train journeys, where you will be the only tourist. Most travelers I met were visiting Kazakhstan for just 1 week, as part of the same Kyrgyzstan trip, so it makes sense for me to start your Kazakhstan travel itinerary in Almaty and the surrounding area. Welcome to Almaty, the most cosmopolitan city in Central Asia. 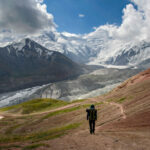 Almaty was the last stop of my 5-month journey through Central Asia. From backpacking in Kyrgyzstan to traveling the Pamir Highway and the Wakhan Valley, trekking the Fann Mountains in Tajikistan, traveling all across Uzbekistan and going across the Kazakh steppe, from west to east, after eating tonnes and tonnes of plov, shashlik, lagman, when I was about to shoot myself, Almaty was like a dream come true. With an endless offer of Western-style cafés, gourmet markets and loads, loads of pubs, cool bars, and a nice craft-beer scene, I stayed in Almaty for around 8 days and it is one of those cities where you could live for a very long time. In fact, I was thinking about moving here but, due to circumstances, I ended up moving to Georgia. There aren’t many sites as such to visit in Almaty, but it is a city to be enjoyed through the amazing social life and Soviet-era buildings. However, you can’t skip visiting the Zenkov Cathedral, a Russian Orthodox church built in 1904 and one of Almaty’s main landmarks; the Green Market, one of the very few accessible places to experience the traditional Almaty and, of course, Panfilov Park, a very beautiful park where a group of 28 Soviet soldiers died fighting against the Nazis. There is actually a really nice monument in their memory. Almaty is, definitely, the highlight of your Kazakhstan travel itinerary. Almaty has a very wide range of both hotels and hostels but here are my recommendations. Backpacker Hostel – Europeans Backpackers Hostel – I stayed here during my whole stay in Almaty. This is the ultimate hostel for budget travelers, including cyclists and people traveling by van. The hostel is, basically, a house, in a very quiet street but, at the same time, very close to the city center. The Wi-Fi is superb and the living-room is filled with extremely comfortable couches. Budget Hotel – Silk Way – This budget hotel is run by some very hospitable women. The location is unbeatable and, given the facilities of the rooms, it looks more like a mid-range hotel but it is actually very cheap. The best option for budget travelers that prefer the comfort of a hotel, rather than a backpacker hostel. Mid-range Hotel – D’Rami – With a very simple, but very new, furnishings, this is another well-located hotel, very comfortable and perfect for older couples and families. Luxury – Rixos Almaty – Built in one of the most beautiful buildings in the city, Rixos is the preferred choice for luxury travelers. If you want to visit all the lakes properly, you will need 3 days, at least. Note that, if you go by public transportation, you may need one additional day, but it will all depend on how you manage your time. The Kolsai Lakes and Lake Kaindy are part of the “Golden Triangle”, a trio of major natural attractions in southeast Kazakhstan, which also include Charyn Canyon and the Altyn-Emel National Park. 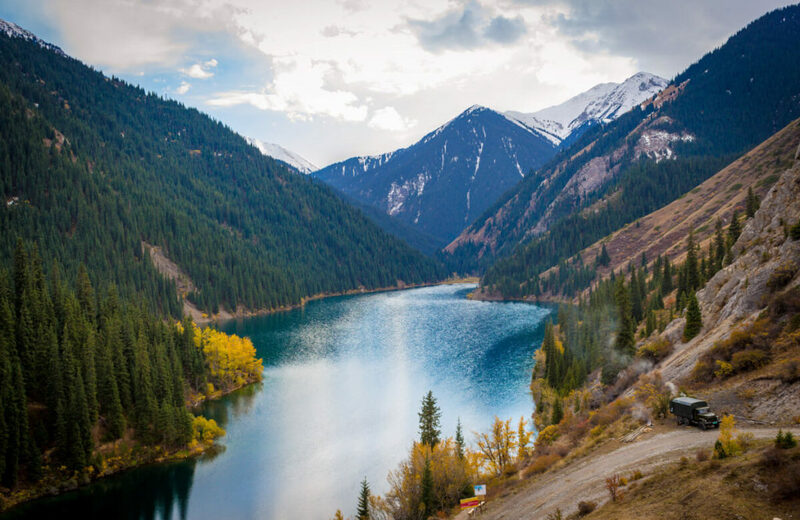 They are a system of three lakes, nestled in the hills of the northern Tien Shan Mountains. The lakes are so clear that on a sunny day, the surrounding forests, hills, and mountains are mirrored in the water! The first lake lies at an altitude of 1,000 meters and it’s the only lake that is accessible by car. The other two lakes (2500 and 2700 meters) can only be reached on foot. It’s an 8-kilometer walk from the first lake to the second one, around 3 hours of hiking. The third lake is an additional 5-kilometer hike. You can visit the first two lakes in one day but it takes, at least, two days to hike all the way to the third lake and back. Lake Kaindy is located in the same region as the Kolsai Lakes and is a true artwork of Mother Nature and one of the top things to do in Kazakhstan! This lake was formed in 1911 after an earthquake triggered a landslide that broke the natural dam surrounding a spruce tree forest. 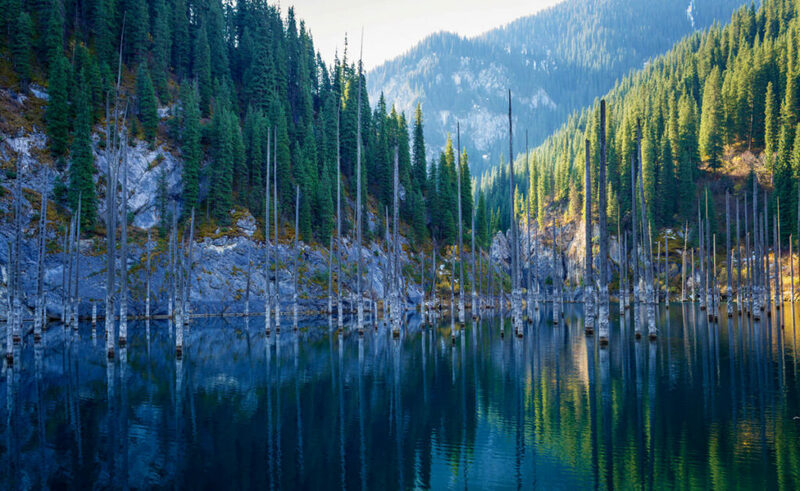 The water submerged the forest and formed a magical looking lake that is now nicknamed ‘The Sunken Forest’. The cheapest way to go independently is by taking a local shared taxi to Kegen, which departs from Sayahat Station and costs 3,000TEN (9USD). Tell the driver to drop you off at the intersection with Saty. From there, it’s another two hours’ drive to Saty, so you can hitchhike or take another shared taxi for 2,000TEN (6USD). Once in Saty, ask your driver to drop you off at the entrance of the park (which will cost you another 1,000TEN), try to hitchhike there. Lake Kaindy is only 36 km from the first Kolsai lake, so the route to get there is pretty much the same. Instead of going all the way to Saty, you have to turn left at the intersection, about 1km before the village. From there, the road towards the lake is very rough, so you’ll need to catch a ride with a 4×4 to get there. If you’re lucky, you’ll meet a friendly driver who will bring you there for free. If the driver asks for money, it shouldn’t be more than 1,000TEN (3USD). If you are planning to go there by public transport, try to wake up before sunrise because it is quite a long journey! Otherwise, you should stay there overnight or go on a tour! Often nicknamed the Kazakh Grand Canyon, when you stand on top of the cliffs and overlook the valley, you would indeed think that, for a second, somehow, you ended up in Arizona instead of in the southeast of Kazakhstan! This canyon is part of the Charyn National Park, which stretches 154km along the Charyn River, one of the deepest rivers of the Northern Tien Shan mountains. Charyn’s red sandstone cliffs are sculpted into the most wonderful shapes and shades that vary from deep orange to light brown. The most famous part of the canyon is “The Valley of Castles”, named after the fantastical shapes that the cliffs resemble. 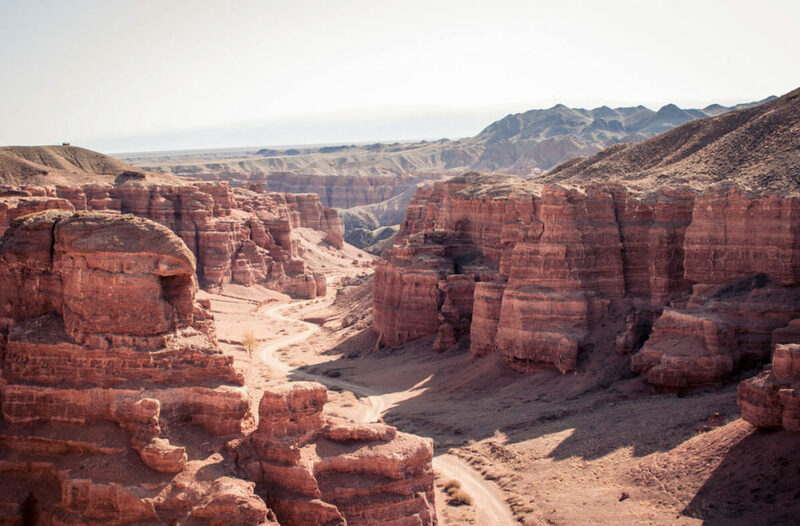 It’s possible to visit the most beautiful parts of Charyn Canyon in one day. However, if you can spare a couple of days, it’s a fantastic experience to camp in the canyon and visit the whole area on foot or by driving around. It takes about 4 hours to get from Almaty to Charyn Canyon. You can get there on a tour but you can also go independently, although it’s a bit of a hassle if you don’t have your own transportation. The easiest way to get there by yourself is by taking a shared taxi from the Sayahat bus station to Kegen, the nearest village to the canyon for 3000TEN (9USD). Ask the driver to drop you off at the intersection with Charyn Canyon. From there, it’s another 10 km of walking or you could always try to hitchhike. This is my suggested two-week travel itinerary for Kazakhstan. Please note that, if you want, you could replace Turkestan and Aksau with Astana, which I have added on the longer itinerary. I didn’t give it priority because I am not a big fan of soulless cities (perhaps, because I lived in Dubai for 3 years? ), so I think that the other two places are far more interesting. 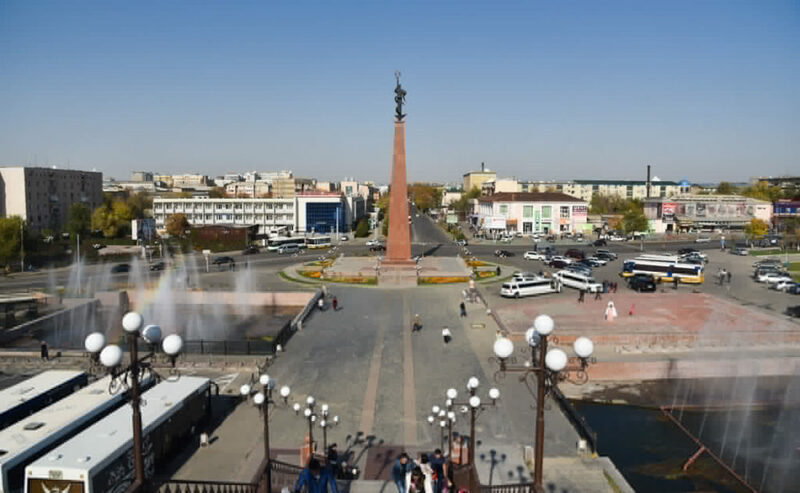 If you are backpacking in Kazakhstan for more than a week, after visiting Almaty and its striking surroundings, you should get on a train going west, to the city of Shymkent. 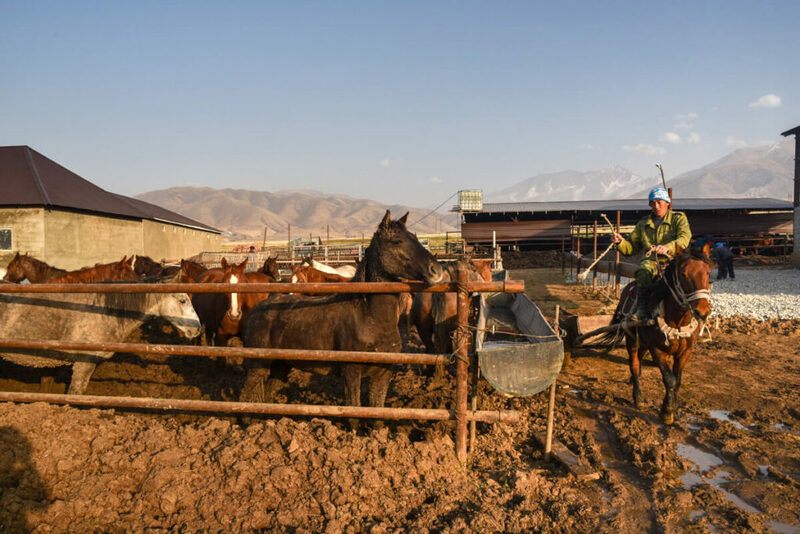 Being the most developed country in Central Asia, it is sometimes hard to experience the real traditional life in Kazakhstan. This is not the case of Shymkent though, one of the oldest cities in Kazakhstan, used as a caravanserai and a trading center during the Silk Road times, in the 12th century. 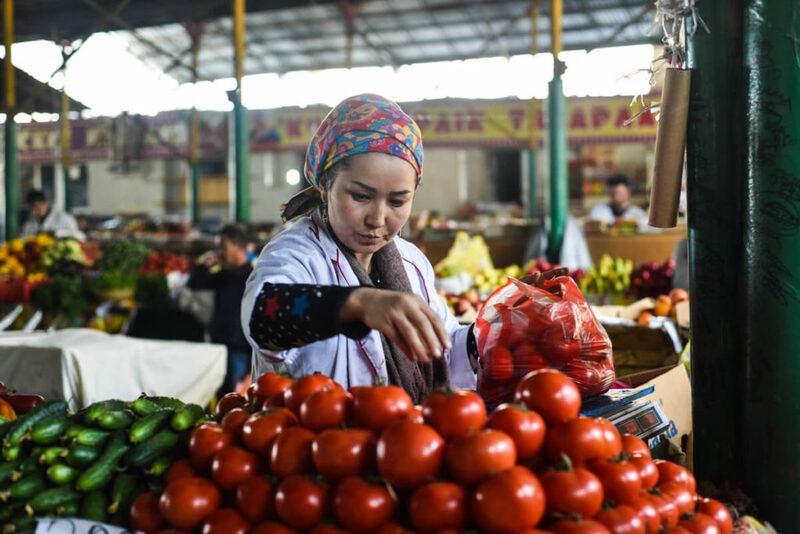 In Shymkent, you will find the largest bazaar in Kazakhstan and one of the most important in Central Asia, consisting of loads of narrow alleys where it is extremely easy to get lost. 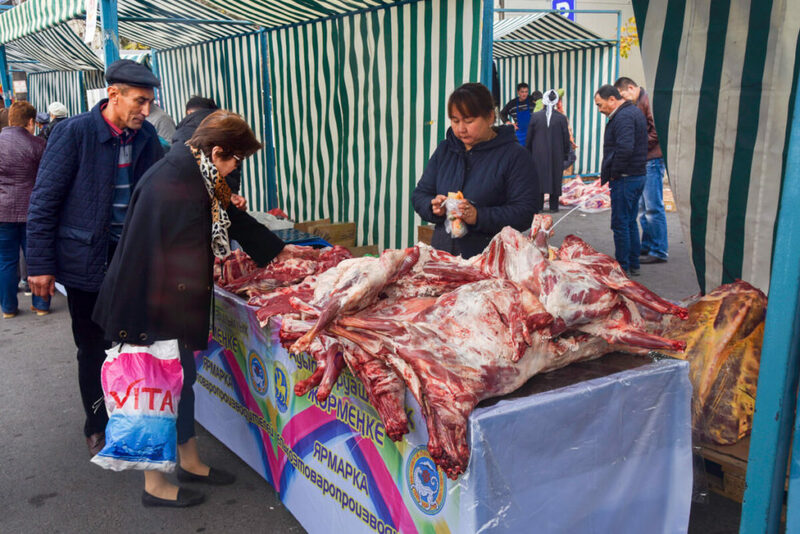 In my opinion, Shymkent is a place worth spending 1 or 2 days in, as there is not much to do besides the bazaar. However, it is a great base from where to go to some very rewarding mountains, and home to the best homestays in the country. Budget Guest House – House Hostel – A very accommodating house and a lovely woman are what all travelers say about this house. 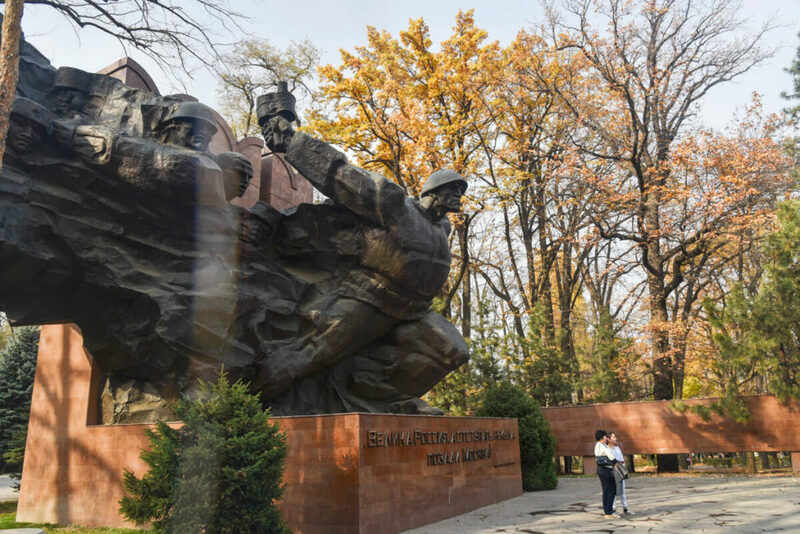 It is a bit far from the city center but there is a bus just next to the guest house passing every 5 minutes and, besides, it is located right next to Aini, the bus station that marshrutkas to Aksau depart from. More mid-range option – Altair Hotel – This place is the most popular hotel among mid-range options, frequented by travelers from all over the world. People like the super spacious rooms, the breakfast, and the very kind staff. 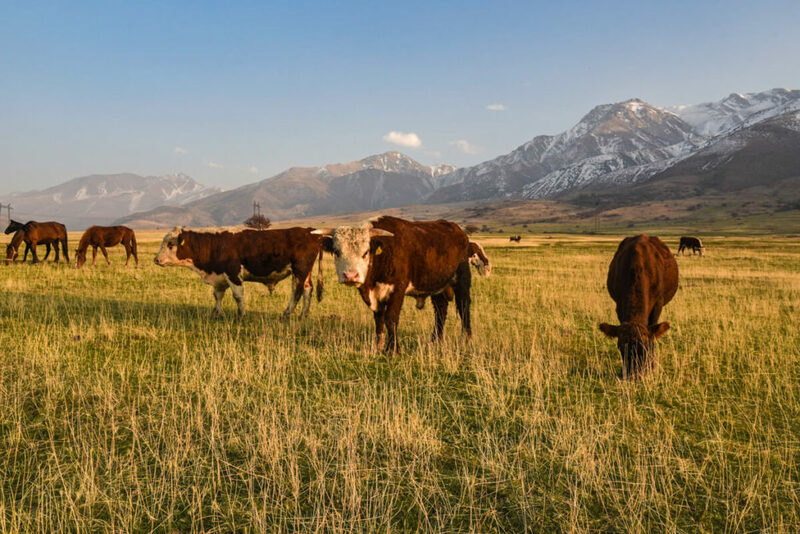 From glaciers to snow-capped mountains, alpine forests, canyons, and steppe, the Aksu Nature Reserve is an amazingly geographically diverse area, besides being the oldest Nature Reserve in Central Asia, established in 1929. The lovely tiny village of Zhabagly is the gate to the national park and a place where you will see a sort of evolved Central Asian nomadic life, in the way that they are still farmers who live from their livestock but, unlike the nomads you meet when you travel in Kyrgyzstan, they have a more developed infrastructure, more expensive cars and, basically, they are no nomadic anymore but they live in this village all year long, some of them living in really nice houses. The biggest downside of Aksau is that you cannot visit it on your own but you must always go with a ranger. For this, when you arrive in Zhabagly, you should go to the headquarters office, where you can arrange your ranger and transportation for the next day. When I went there, I said that I wanted to go there on my own and, unexpectedly, they took it in a very bad way and told me to leave. I told them to please calm down, that I was just asking if it was possible but no way, you need to go with a ranger. Unfortunately, I don’t really remember the prices, but I can recall that it was very affordable, around 20USD, including transportation and the ranger. However, I decided not to go, as I was there on my own and didn’t feel like to spend the whole day with a non-speaking English dude looking after me. 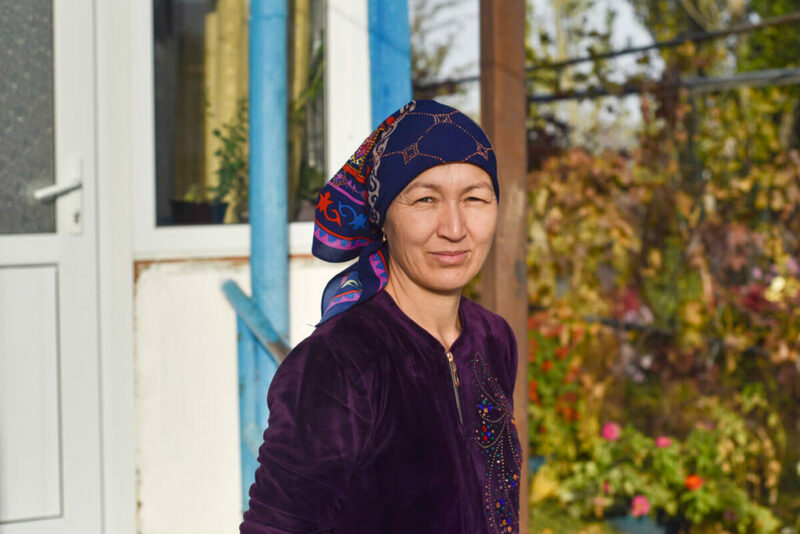 Instead, I decided to stay in Zhabagly, which was beautiful enough to spend 1 or 2 days in, doing a few short hikes and taking photos of all the Kazakh farmers and their livestock. There were loads of horse farms and that is because this village is famous for its horse meat. Marshrutkas leave for Zhabagly from Aina bazaar, located here: 42.327384, 69.630521. It is a 2-hour ride and the first one is supposed to leave around 9-10am. However, since I went there on a Monday, the only day of the week that the bazaar is closed, I remember that I waited for almost 3 hours for the marshrutka to be filled. There are quite a few homestays in Zhabagly, so you should be fine if you just show up there. The one I stayed at was recommended by the lovely woman from House Hostel and it was great. I paid around 15USD, with three meals included and a very comfortable, private room. Located 170km from Shymkent, it is very easy to get to Turkestan on a train. 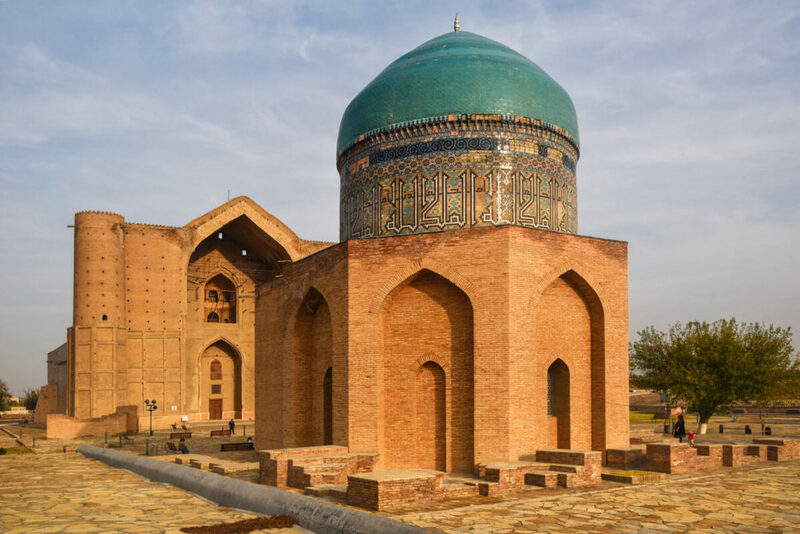 The spiritual capital of Kazakhstan, Turkestan is home to the most important pilgrimage site and monument in the country, the Mausoleum of Khodja Ahmed Yassaui, a UNESCO listed Heritage Site. With turquoise domes and blue tiles, this building has the same style as many other buildings in Iran and, especially, in Uzbekistan. The Mausoleum is definitely stunning but, to be very honest, since I was coming from Uzbekistan and had already been traveling in Iran, I was not that impressed but please, just take my statements with a grain of salt. Entering the Mausoleum costs 500TEN (1.50USD). The complex is very close to the main central square, which is connected to many pedestrian alleys where the local life is going on. When I was there, they were celebrating a traditional, local festival, where everybody was playing music and dancing in their traditional dress. A nicer place – Hotel Khanaka – I came here one day for breakfast and to steal some Wi-Fi and it looked like a very nice place, besides being one of the only options which you can actually find online. This is the best option for mid-range travelers. 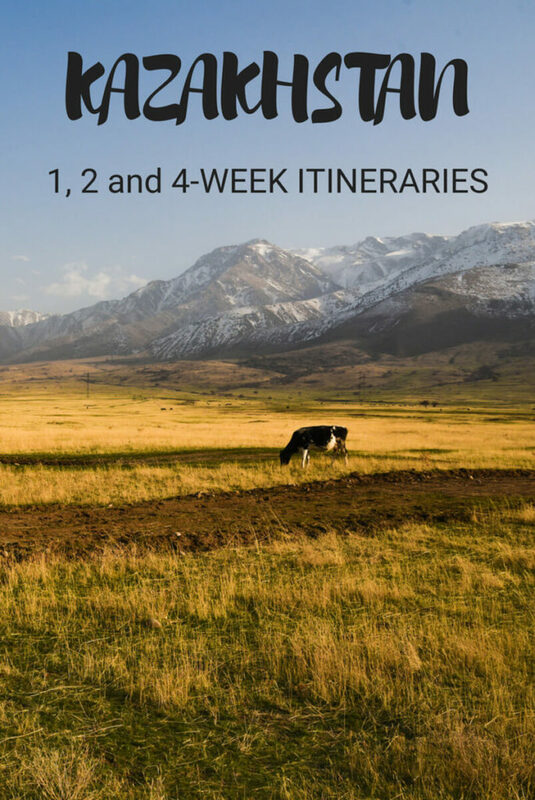 If you are backpacking in Kazakhstan for 4 weeks, it makes sense to modify the order of the itinerary. Day 1 to 7 – Almaty, Charyn Canyon and Kolsai and Kandy Lakes. Tip – On the fast train, it is a 12-hour ride, so take the night train! The slow train takes 24 hours so, if you are on an ultra-budget, 3 days for Astana won’t be realistic. 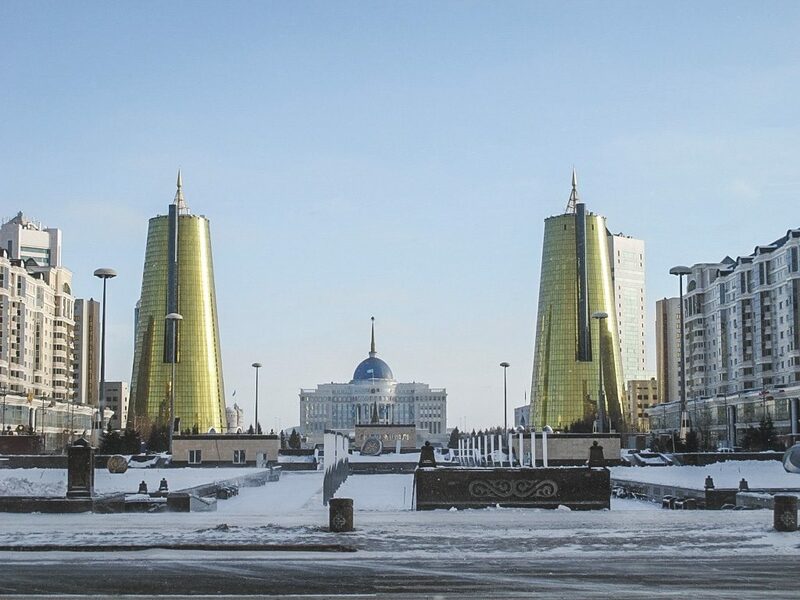 Astana is Kazakhstan’s city of the future. 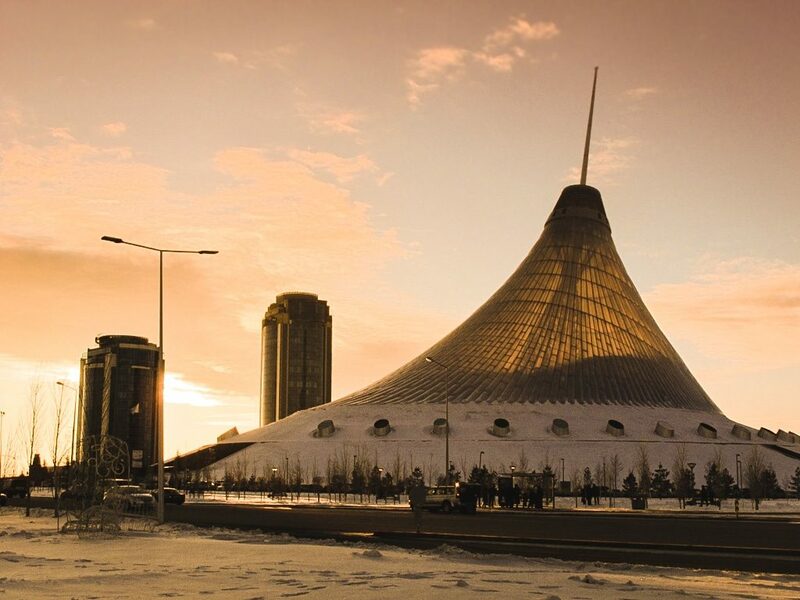 The city’s name means capital city in Kazakh and the capital of Kazakhstan was moved from Almaty to Astana in 1997 and has served as such since. With just over a million residents, Astana is a Central Asian hub for modern architecture enthusiasts. World famous architects have designed several of the city’s buildings, giving it a futuristic and almost otherworldly feel. The city is slowing coming into its own and has world-class restaurants, specialty coffee shops, and an array of sightseeing opportunities for visitors. By the way, this is the second coldest capital city in the world, so plan accordingly for your visit! In Astana, you will find plenty of sights scattered around the city that will pique your interest. Be sure to check out Baiterek, the city’s symbol and where you can even take a ride to the top and get a nice glimpse of the city. Khan Shatyr is a mall and entertainment center that will, inevitably, be one of the most unique places you’ll ever step foot in. The Palace of Peace and Reconciliation is also a can’t-miss place in Astana, as it is in the shape of a pyramid and lights up colorfully at night. By train, you can get to Astana from pretty much everywhere in the country, Almaty and Shymkent being the easiest places. The fast train from Almaty takes around 12-13 hours and the slower one takes up to 24 hours. Check out routes and timetables at Ticket.KZ. A ticket from Almaty to Astana will likely cost you anything from 15USD for a platzkart sleeper on the slow train to 60USD for a VIP place on the fast train. For more information, read: Should you travel to Astana? Budget Hostel – Hostelland – I can assure you that, for this price, you will never ever be in such a nice hostel, with such clean rooms and modern facilities. The staff are super friendly and you will always find a very international atmosphere. Mid-range hotel – Brown Hotel – For families, couples and any mid-range traveler, this is an extremely well-located hotel, right in the new city of Astana, that serves some of the best food you will ever taste in Kazakhstan. Luxury – Rixos Hotel – For luxury travelers, in Kazakhstan, I like recommending Rixos because they are always placed in the most beautiful building of the city, besides having an unbeatable location. Baikonur is history and that is why, here, you find the Baikonur Cosmodrome, which is the Russian equivalent of NASA’s Kennedy Space Center. This is nothing else than the place where both the dog Laika and Yuri Gagarin (the first human in space) were launched. Unfortunately, you can only visit the Cosmodrome on an organized tour, with prices starting at 700USD, and the permit takes a few months to process. Moreover, visiting Baikonur town is technically not allowed, even though there are many ways to sneak into it. I actually did it and managed to spend the entire day there. 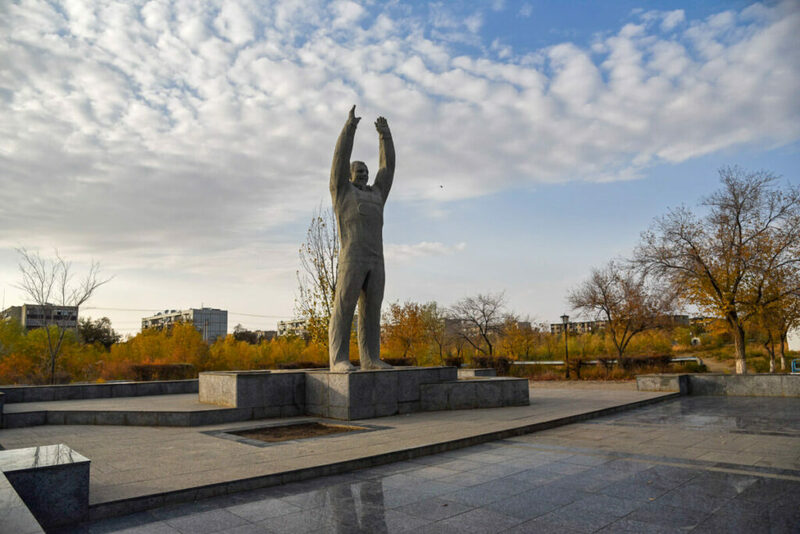 Around town, you will find a few cosmonaut statues, an illegal space missile and other space-related monuments which are really worth checking out. By the way, Baikonur is administered by Russia, meaning that they use the Russian ruble and pretty much everybody is ethnically Russian. From Turkestan, you should take a train to Tyuratam, a small village which is a few kilometers away from Baikonur. Tyuratam is 530km from Turkestan and the journey takes 10 hours. 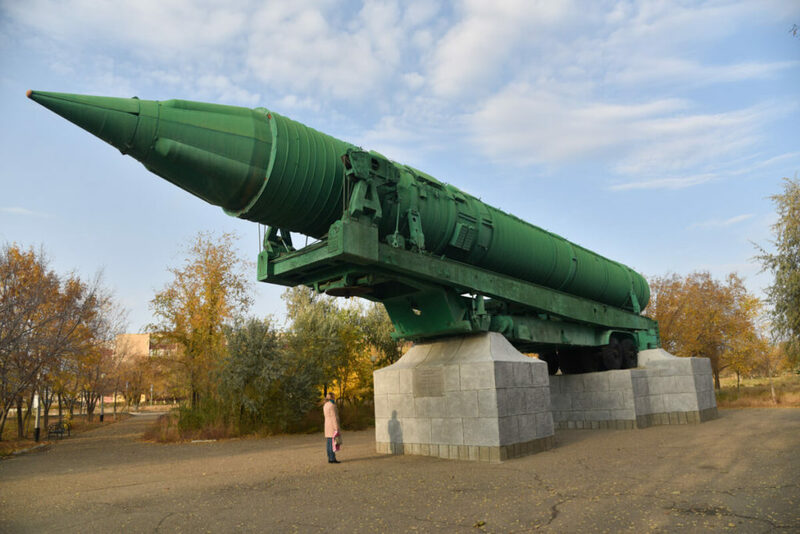 If you don’t manage to take a night train, there are a few budget hotels where it is legal to stay in Tyuratam so, you can go to Baikonur on the next day. A statue of a famous Russian astronaut. Probably the first one to ever go to space? Aralsk is only a 4-hour train journey from Baikonur. In 1960s, when Kazakhstan was part of the USSR, the Russians decided to divert the two major rivers that fed the Aral Sea to irrigate an arid land to produce cotton and become one of the top world’s cotton exporters. 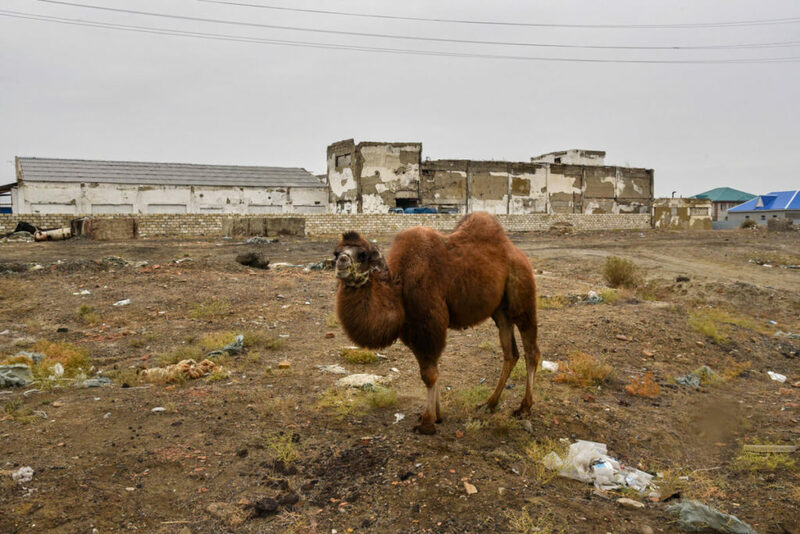 As a consequence, over the decades, the Aral Sea shrank almost completely, becoming an actual desert. It is very unfortunate to think that the worst environmental disaster that ever happened on Earth is, sadly, a touristic attraction in Kazakhstan and, actually, the one Kazakhstan is famous for. Nevertheless, I also think that, if you are sensitive enough, there is nothing wrong with coming here with the intention of learning and showing your respect. 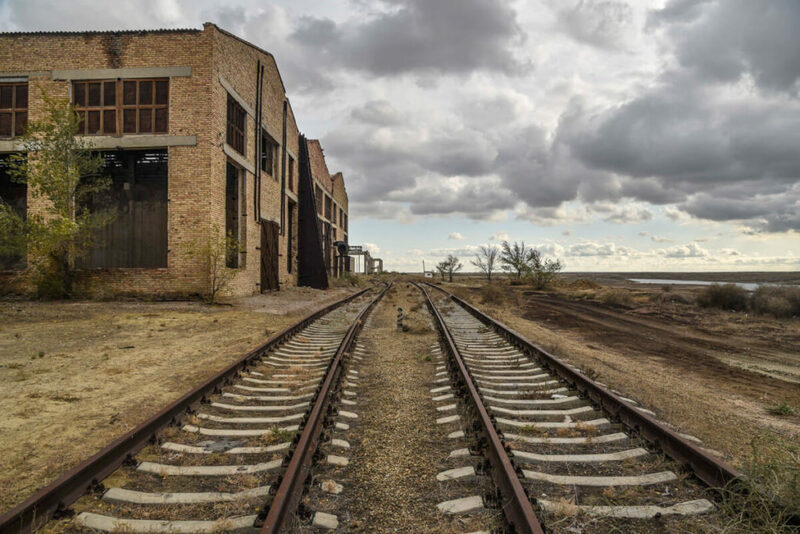 The most important city by the Aral Sea, on both Kazakh and Uzbek sides, used to be Aralsk, a big center for the fishing industry, composed of tens of factories and a real industrial zone that used to even have a train stop. 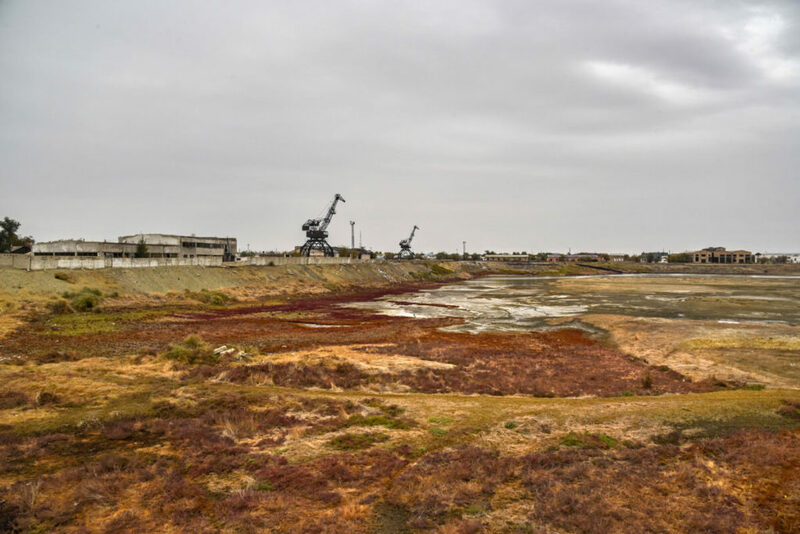 Today, Aralsk is a hopeless town that has a port without sea and a huge abandoned industrial zone. 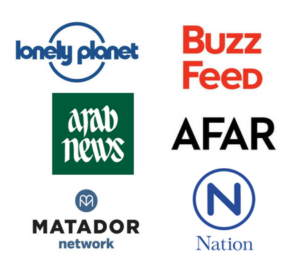 I wrote the full guide to the Aral Sea for Everything Everywhere: A guide to visit the Aral Sea in Kazakhstan. The famous creepy Aral Hotel, which used to be the only option in town, is now closed. Instead, there is a one called Altair Hotel right next to the train station, hosting all kinds of people, from backpackers and any kind of independent traveler to Kazakh businessmen that bring prostitutes to their room, at least in our experience. It is a very weird place but rooms are clean and they even have a budget dorm. They serve an OK dinner and Wi-Fi works perfectly. For more information, including things to do and how to go to the ship graveyard, an article is on its way. 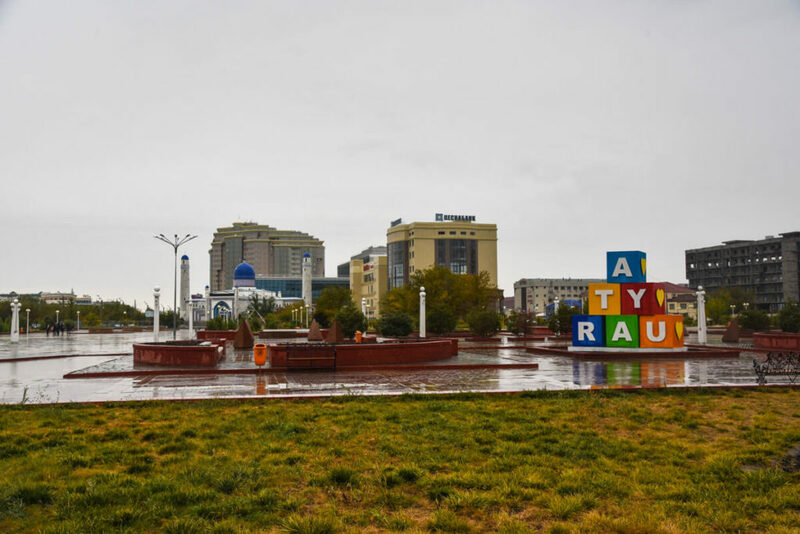 Atyrau is a 20-hour train journey from Aralsk, so it is your own decision to assess whether the long journey is worthwhile or not. The city of Atyrau is another strange place in Kazakhstan. On the one hand, it is very rarely visited and most travelers you will meet there are people overlanding to Russia. On the other hand, it is a very wealthy city, like nowhere else in the country and it is the main town the Ural goes through, which is the official border between Asia and Europe. If you go over any of the many bridges in the city, you can switch continents in a matter of seconds. Other than that, Atyrau is home to some of the largest oil reserves in the country, so now you understand why the town is so developed. It has a wide offer of Western-style cafés and international pubs filled with expats working in the oil industry and banks, loads of banks. 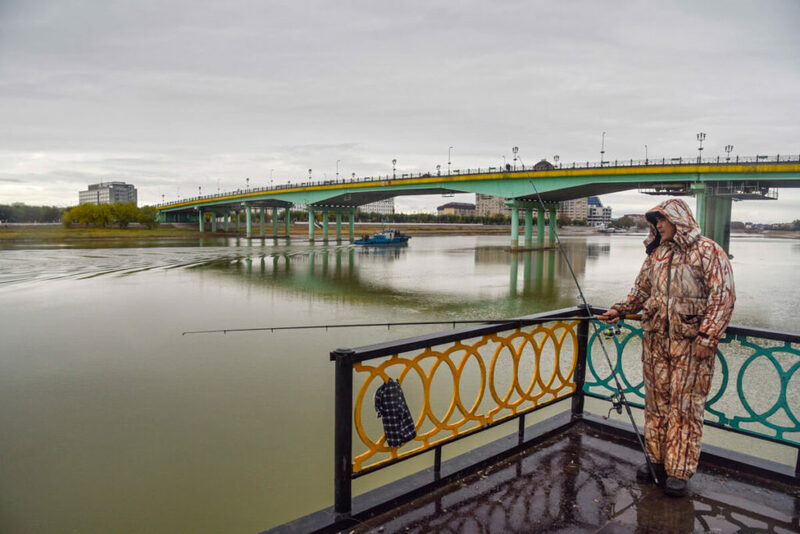 For me, Atyrau was sort of a cultural shock as this was my first actual destination after crossing from Uzbekistan and spending 4 months traveling is really remote destinations in Central Asia. To be very honest, I was not expecting such a modern city. Being an oil-rich town, Atyrau has very few budget options but plenty of nice hotels. Budget Hostel – Joy Hostel – It is a very OK place if you are on a budget but don’t expect much of it. Mid-range hotel – Mini Hotel Venezia – A very cute hotel that brags about serving some of the nicest Italian food in town. It is one of the top mid-range options in Atyrau. Luxury – Sultan Palace Hotel – One of the most famous hotels in town, located in a very nice building, this is a good option for travelers looking for real comfort. The rest of the days – It depends. What is your plan? 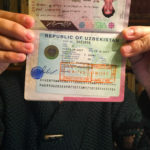 You want to go back to Almaty – Great, it is a 3-day journey, so you are pretty covered. You are traveling to Azerbaijan – Fantastic. Take a train to Aktau (around 16 hours) and wait for the ferry. Don’t forget to check my 2-week Azerbaijan itinerary. You are traveling to Russia – WOW, I am so jealous. Well, it’s very easy. There are daily direct trains with Volgograd as the final stop. Travel insurance for Kazakhstan – As I told you before, remember to get travel insurance. 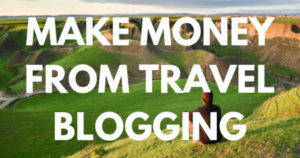 I recommend you read how to get the right travel insurance for backpackers. 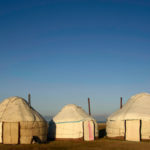 More articles about Central Asia – I have plenty of guides to Tajikistan, Kyrgyzstan and Uzbekistan. Traveling by train – Check prices and timetables at Ticket.KZ and, for practical information, read my Train Guide to Kazakhstan. This is everything you needed to know for planning your itinerary for backpacking in Kazakhstan. If you have any other suggestions o question, kindly post them in the comment section. Thanks! You are spot on Joan when you say it is a different world than the rest of Central Asia. I see this without stepping foot in the country; all its richness and range and wildlife and history. Delightful. Kazakhstan is a country with very weird places but truly awesome. Cheers Ryan!